We’d love your help. Let us know what’s wrong with this preview of Shelter by Céline Claire. As a big storm approaches, two strangers arrive in the forest. All the animal families, safe in their homes, are worried. They wonder, “What are they doing there? What do they want?” So, as the pair knocks at the door of one home after another asking for shelter, all the animals turn them away, leaving them to fend for themselves. But then an accident suddenly forces the f As a big storm approaches, two strangers arrive in the forest. All the animal families, safe in their homes, are worried. They wonder, “What are they doing there? What do they want?” So, as the pair knocks at the door of one home after another asking for shelter, all the animals turn them away, leaving them to fend for themselves. But then an accident suddenly forces the fox family out into the snow and the wind, and the foxes find they must ask these outsiders for help. Will they find it in their hearts to give it? To ask other readers questions about Shelter, please sign up. The lovely story of Shelter was written by Céline Claire and the adorable illustrations were done by Qin Leng. Being compassionate is one of the major lessons that kids will learn from the story. Aside from that, the value of friendship is more important than material and impermanent things were also addressed in the story. This is a recommended read for kids 7 and below, but adult readers, such as parents, will also appreciate this charming book. I wasn't sure if I liked the illustrations in this one at first, but they grew on me. This is a cute story about generosity with woodland creatures playing the roles. When two strangers come to the woods during a storm, nobody wants to help them, even though they are in a position to. But when the tables are turned, a family is taught an important lesson. The story is poignant, but simple enough for kids to understand. And the illustrations of all the animals in their various shelters (and clothe I wasn't sure if I liked the illustrations in this one at first, but they grew on me. This is a cute story about generosity with woodland creatures playing the roles. When two strangers come to the woods during a storm, nobody wants to help them, even though they are in a position to. But when the tables are turned, a family is taught an important lesson. The story is poignant, but simple enough for kids to understand. And the illustrations of all the animals in their various shelters (and clothes!) are really cute. 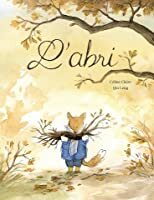 This is a gentle fable (originally published in French) that contains beautiful and absorbing artwork, full of earth tones and winter blues. In a forest neighborhood, a storm is coming. The animals get ready, but when a pair of strangers show up asking for shelter from the cold, they receive very mixed reactions -- but as the storm worsens, one family finds themselves needing shelter too. 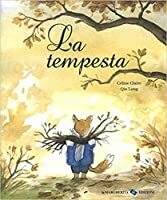 Different people will probably take different messages from this story (some reviewers see a possible "clima This is a gentle fable (originally published in French) that contains beautiful and absorbing artwork, full of earth tones and winter blues. In a forest neighborhood, a storm is coming. The animals get ready, but when a pair of strangers show up asking for shelter from the cold, they receive very mixed reactions -- but as the storm worsens, one family finds themselves needing shelter too. Different people will probably take different messages from this story (some reviewers see a possible "climate change" statement here since the visitors are polar bears), but for me the takeaway is that the best way to receive is through giving, and that compassion can breed more compassion. I thought the story was well told. Sometimes, the more important the message, the easier it can be for storytellers to communicate in heavy-handed ways, but I believe that was mostly avoided here, because the story can stand on its own. I assume the heart of this story is related to the current global refugee crisis, and if that's the case then this is a timely story indeed. The first thing I noticed about this book was the artwork. It's amazing in every way. Definitely has the feel of reading an older book I used to read when I was a child. We are introduced to a small group of animals all preparing for a storm that's moving in. Two little bears are stuck out in the storm and try to seek refuge from it trying door after door with no luck. A friendly fox decides to help the bears out with a tiny gift. As usual in children's stories, this good deed does not go unnoti The first thing I noticed about this book was the artwork. It's amazing in every way. Definitely has the feel of reading an older book I used to read when I was a child. We are introduced to a small group of animals all preparing for a storm that's moving in. Two little bears are stuck out in the storm and try to seek refuge from it trying door after door with no luck. A friendly fox decides to help the bears out with a tiny gift. As usual in children's stories, this good deed does not go unnoticed, and in the fox's time of need, they are helped after a disaster was threatening to happen within his den. What a gentle and moving look at community...who we welcome in, who we turn away, and unexpected kindnesses when they are needed most. A beautiful book with a beautiful theme of kindness to others. As a storm rolls in animal after animals denies shelter to two lost animals until finally in a reverse of fate some animals need shelter and ask the bears for help, which they provide. An excellent book to talk about kindness and helping other and not being afraid. I'd highly recommend pairing it with the new book Leaf by Sandra Dieckmann that is set to come out around the same release date to make a unit of kindness picture books. L A beautiful book with a beautiful theme of kindness to others. As a storm rolls in animal after animals denies shelter to two lost animals until finally in a reverse of fate some animals need shelter and ask the bears for help, which they provide. An excellent book to talk about kindness and helping other and not being afraid. I'd highly recommend pairing it with the new book Leaf by Sandra Dieckmann that is set to come out around the same release date to make a unit of kindness picture books. Love. Love. Love. Highly recommend. Not sure if this is supposed to be a reflection on global warming, and of the refugee crisis and how the media treats and thinks about refugees, as the main characters are polar bears, looking for a place to stay to survive the storm, but if so, its a sound picture-book to introduce children to this topic. Maybe not as impactful as The Journey, but still a resonating picture book nonetheless. Also the illustrations of the animals are adorable. A simple and sweet book about kindness. A message that is important to share today. As a winter storm approaches, all the animals prepare. But when a pair of bears arrive in the midst of the big storm, no one is willing to give them shelter, food, or light. The bears make their own shelter in a snow drift. But when the foxes den starts to cave in they hurry out and the bears take them in. Thank you to NetGalley for providing an ARC of this book. Shelter by Celine Claire is a beautifully illustrated children's book with a meaningful message on the effect of sharing with others and selflessness. The illustrations reminded of books from my own childhood; soft, muted watercolors. I loved that the book anthropomorphizes woodland animals in their adorable little jackets and mittens. It's very "Redwall-esc". A terrific little book! Nice fall/early winter story about sharing. I loved the illustrations. A couple of bears get caught in a very bad winter storm and no one will help them until a young fox offers them a lantern. I received a Kindle copy from Edelweiss in exchange for a fair review. This heartwarming book is the epitome of how those seeking solace from a huge storm should be treated. It highlights the vital importance of practising kindness, generosity and hospitality to those seeking a safe haven from peril. A small community of animals are preparing for a huge winter storm that is blowing into their midst. They gather wood and store up food to ensure their families will be protected from the harsh tempest. They seal off their homes and hunker down safe and warm while the This heartwarming book is the epitome of how those seeking solace from a huge storm should be treated. It highlights the vital importance of practising kindness, generosity and hospitality to those seeking a safe haven from peril. A small community of animals are preparing for a huge winter storm that is blowing into their midst. They gather wood and store up food to ensure their families will be protected from the harsh tempest. They seal off their homes and hunker down safe and warm while the raging storm blows furiously outside. Two bears that are strangers to the area residents are passing through and come knocking on doors seeking shelter and some comfort food until the storm passes. They come offering tea for their admittance in hope that some generous animal will open up their doors for them and let them come in and abide a while. "The wind is cold. In exchange for some tea, could we warm ourselves by your fire?" Alas, no one will allow them entry even though each family is snug and comfortable inside their hovels. The bears must move on and finally out of desperation they decide to create their own make-shift, temporary shelter to shield them from the raging elements swirling all around them. The fox family experiences a disaster in their den and now it's their turn to go out into the wicked storm and try to seek help from the others. They see a light up ahead and can smell the scent of ginger and cinnamon..... mmmmmm! Who do you suppose the animals were that reached out to this devastated family in their desperate time of need and welcomed them warmly into their abode? I think you can guess right? This is a sweet story that has a wonderful life lesson to proclaim. Its message is simple and clear... take a risk, reach out to those in need and be kind and generous to them. The principal of reciprocity rings true - we pay back what we receive from others, in other words, if John does you a favour, you're likely to return it to him. What goes around comes around is another way of putting it. The illustrator uses warm soft colours to visually tell the tale. The ink and watercolour illustrations are perfect for the narrative. I highly recommend this book. This review was originally written for The Baby Bookworm. Visit us for new picture books reviews daily! Hello, friends! 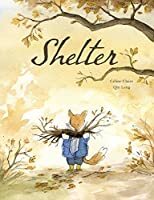 Our book today is Shelter by Céline Claire and Qin Leng, a lovely fable about kindness, generosity, and helping those in need. A storm is coming, and all the animals of the forest are rushing to prepare. They fill their food stores, gather fuel for their fires, and secure themselves against the harsh weather, tucking into their homes just as the big storm hits. Outside, two young polar bear siblings approach, exposed to the elements. They knock on each door, asking for whatever food, shelter, or warmth can be spared, offering what little they have in return. Each family sends them away, protesting a shortage of resources (though they clearly have more than enough). The bears head toward an abandoned hill, hoping to make a hasty shelter, when Fox Cub calls out to them. He offers them a small lantern – not much, he apologizes, but it’s what he has. The polar bears thank him kindly, and after Fox Cub leaves, it begins to snow. The polar bears are heartened – this is something they know how to survive. Back at the Fox den, the heavy snowfall causes their roof to collapse. Turned out of their own home, they search for shelter, following a dim light to a pair of familiar faces who welcome them with open arms. Simply beautiful. A moving story about why kindness and charity towards others makes entire communities stronger. This definitely reads as a metaphor for helping displaced refugees and/or the needy, and it’s an apt one, especially in the visual nods to the abundance of resources, and the fact that the bears appear to be relatively young orphans. It’s a tale about how our kindnesses, even small ones, are so often the thing that light our own way out of the dark. The art is gorgeous, with rich, detailed characters that bring real emotion and personality to each of the animals from head to toe. The length is great, and JJ and I both enjoyed it. A wonderful lesson for little ones, and it’s Baby Bookworm approved! Full of gorgeous graphics in a pretty wrapping, Shelter is a great kids story with a beautiful message. The images are reminiscent of my childhood of Winnie the Pooh, Watership Down, Peter Rabbit and Wind in the Willows, both familiar and comforting while being new and interesting. The writing is, thankfully, always easy to read which can be difficult for a picture book. Whoever chose the placement of the text cleverly made use of a lot of white space which led the eye from one image to another, when appropriate. Told in present tense, it leads the reader through a series of images that illustrate the words beautifully, while exploring the world of animals who need to take shelter during a storm, preparing from the minute they wake to the news to the minute the storm hits. The curiosity and uncertainty of the animals is a nice touch of human behaviour in a way that children can appreciate and learn through. The lesson is simple but profound, in the way it's presented; people can assist others that are known to them – as all the animals help each other prepare for the storm – but can be distant and mistrustful of strangers, even to the extent of lying about fires being out and having no food when the opposite is true. This is a beautiful story that shows that even the honest who want to help but can't can offer a little something of themselves out of kindness, even when they are less well off than others. And strangers can be more welcoming than those they should be able to depend on, even when shown no generosity from others. Shelter is a beautiful story wilt a heartwarming message about kindness and consideration for others. The illustrations are done in a soothing, soft style selecting various animals. Shelter is a good suggestion for children who love animals. The kindness of some of the animals is rewarded with kindness when they are themselves in need. A beautifully illustrated example of the need for kindness and consideration for others. Revived this book for review purposes. As a big storm approaches, two strangers arrive in the forest. All the animal families, safe in their homes, are worried. They wonder, ?What are they doing there? What do they want?? So, as the pair knocks at the door of one home after another asking for shelter, all the animals turn them away, leaving them to fend for themselves. But then an accident suddenly forces the fox family out into the snow and the wind, and the foxes find they must ask these outsiders for help. Will they find it in their hearts to give it? In today's world, we are taught to fear the unknown. We are weary of strangers and stingy with our possessions. We distrust those who are different from us and let our ignorance keep us from seeing the similarities we share. In times like these, it's comforting to know there are books out there like Celine Claire's Shelter. This beautifully illustrated picture book is reminiscent of "The Little Red Hen." It teaches readers that by helping others, we are also helping ourselves. Set in the forest, In today's world, we are taught to fear the unknown. We are weary of strangers and stingy with our possessions. We distrust those who are different from us and let our ignorance keep us from seeing the similarities we share. In times like these, it's comforting to know there are books out there like Celine Claire's Shelter. This beautifully illustrated picture book is reminiscent of "The Little Red Hen." It teaches readers that by helping others, we are also helping ourselves. Set in the forest, this story shows various animal families as they prepare for an incoming blizzard. Birds, foxes, hogs, and rabbits work together to gather food and firewood so they can outlast the storm. While the storm is raging, two mysterious strangers appear and ask each animal family for help. One by one, they are turned away. The only animal to show the strangers any kindness is a young fox. When disaster threatens the fox family, they are able to rely on the strangers to help them in return. The illustrations in Shelter are done with pen, ink, and watercolor by Qin Leng. With soft colors and adorable anthropomorphic animals, children of all ages will enjoy the pictures that accompany the story. As an adult reader, I found the illustrations to be very whimsical. They left me with a strong feeling of nostalgia for certain books of my childhood, such as A.A. Milne's Winne the Pooh. There is great value in the message of this book. As a teacher, I can see it being used to teach lessons about kindness, acceptance, and friendship. Shelter was a joy to read and would be a worthy addition to your home or classroom library. As a big storm approaches, two strangers arrive in the forest. All the animal families, safe in their homes, are worried. They wonder, ?What are they doing there? What do they want? So, as the pair knocks at the door of one home after another asking for shelter, all the animals turn them away, leaving them to fend for themselves. But then an accident suddenly forces the fox family out into the snow and the wind, and the foxes find they must ask these outsiders for help. Will they find it in thei As a big storm approaches, two strangers arrive in the forest. All the animal families, safe in their homes, are worried. They wonder, ?What are they doing there? What do they want? So, as the pair knocks at the door of one home after another asking for shelter, all the animals turn them away, leaving them to fend for themselves. But then an accident suddenly forces the fox family out into the snow and the wind, and the foxes find they must ask these outsiders for help. Will they find it in their hearts to give it? Céline Claire's heartwarming picture book story delivers a timeless and timely message about the importance of kindness and generosity. With simple and evocative language, it explores how even small gestures can make a big difference to the strangers or outsiders in a community. Artist Qin Leng uses a warm, soft palette in her ink and watercolor illustrations creating a charming and inviting visual narrative that is perfect for young children. This book provides a wonderful opportunity for discussions about being welcoming and helping others in need, including how children can put this into practice by reaching out to the ?new kid? or the one who seems different. It also works well for character education lessons on kindness, caring and empathy. Subject: Animals -- Habitations -- Juvenile fiction. Winter storms -- Juvenile fiction. 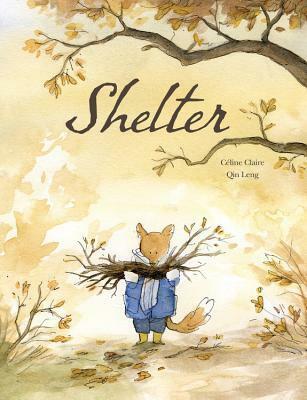 Written by Céline Claire, with illustrations by Qin Leng, Shelter is the story of an animal community as the families within it prepare for a coming winter storm. Published by Kids Can Press, the narrative follows the close-knit families as they gather food and bunker down to ride out the harsh weather in their homes. As the storm begins to worsen, the families are each approached by two strangers at their door asking for help; a plea they all turn away except for the young fox. The story conclud Written by Céline Claire, with illustrations by Qin Leng, Shelter is the story of an animal community as the families within it prepare for a coming winter storm. Published by Kids Can Press, the narrative follows the close-knit families as they gather food and bunker down to ride out the harsh weather in their homes. As the storm begins to worsen, the families are each approached by two strangers at their door asking for help; a plea they all turn away except for the young fox. The story concludes with the strangers helping the fox family after their den collapses under the weight of the snow. Shelter is a story about community, acceptance, and generosity. Claire shows the reader how different family groups work together, despite their varied animal heritage and counters that togetherness by introducing outsiders to the neighbourhood who reject them. The narrative does an excellent job of explaining complex subjects to young children. The illustrations in Shelter are exceptional as Leng uses her unique style to add charm and warmth to the pages. The windswept art lends itself perfectly to the forest setting, offering readers a glimpse into the wild, yet calming atmosphere surrounding them. Stories about animals are a wonderful way to teach or remind children how they should treat others. My own kids’ teachers have often encouraged parents to make up and use such stories (in oral storytelling format) to help modify behaviors or work through problems. Shelter by Céline Claire is an excellent example of this teaching tool, teaching kindness and caring toward others—even strangers—who are in need. The story is very concise—just a few lines on each page—and all of the words are well wi Stories about animals are a wonderful way to teach or remind children how they should treat others. My own kids’ teachers have often encouraged parents to make up and use such stories (in oral storytelling format) to help modify behaviors or work through problems. 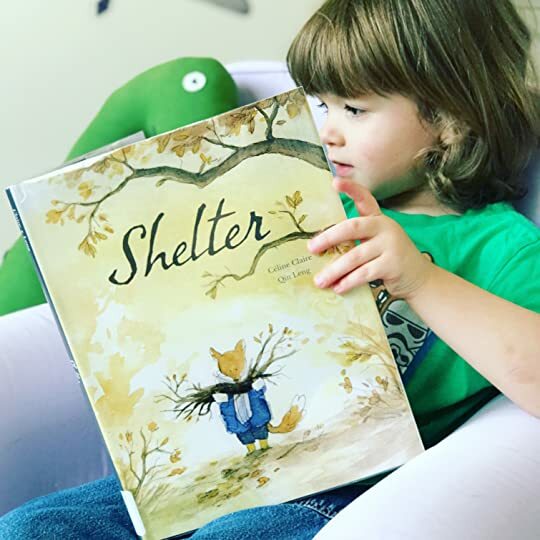 Shelter by Céline Claire is an excellent example of this teaching tool, teaching kindness and caring toward others—even strangers—who are in need. The story is very concise—just a few lines on each page—and all of the words are well within a young reader or listener’s understanding. This is the tale of five families of forest animals who wake one morning to learn that a storm is coming. They prepare by gathering wood and stockpiling food. Soon, everyone is safely tucked away in their homes—except two strange bears who emerge from the fog as the wind howls. The bears ask the different animal families for help, but are turned away at one door after another. My little one’s reaction to the way the bears were being treated was all I needed to see to know that the moral of this story was hitting home for her! Shelter by Céline Claire is a lovely book reminding us that we can do better than others do to us. There is also the idea of a little child will lead, in this case a little fox. After reading this with my grandchildren, we discussed why the author had Little Fox give the gift to the Brother Bears. Was his family in agreement will what he did or did they even know? Also, what might have happened differently of he had not. We all agreed that the “strangers” seemed to act in character and might hav Shelter by Céline Claire is a lovely book reminding us that we can do better than others do to us. There is also the idea of a little child will lead, in this case a little fox. After reading this with my grandchildren, we discussed why the author had Little Fox give the gift to the Brother Bears. Was his family in agreement will what he did or did they even know? Also, what might have happened differently of he had not. We all agreed that the “strangers” seemed to act in character and might have well still done their good deed anyway. It was fun to guess what sort of bear the “strangers” were as they went door to door adding a bit of mystery to this story of kindness. What a delight to guess right as the snow storm came. Easy guess for the six-year-old but a thinking one for three-year-old. The art work has a lovely watercolor painted effect that enhances the feel of the coming storm. The text is short but expressive. First semester second grade readers should find this text easy enough but children much younger will enjoy the story read to them, especially since the idea of a kind deed is ageless. The publisher through Net Galley provided a copy. The animals are all getting ready for a big storm. 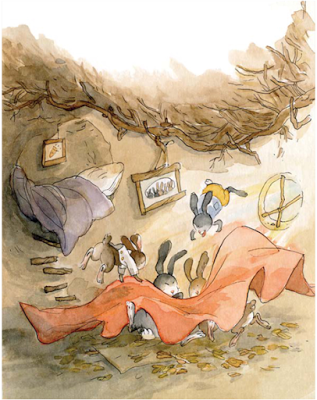 They have closed their doors and are making their dens cozy and warm. Two strangers arrive out of the blustery wind and begin to ask at each door for shelter. They have tea to offer, but one after another the neighbors all say no. The little fox though heads out with a lantern for them, but nothing more. As the snow begins to fall, the strangers know they will be fine. But the fox family’s shelter is failing due to the weight of the snow. Soon t The animals are all getting ready for a big storm. 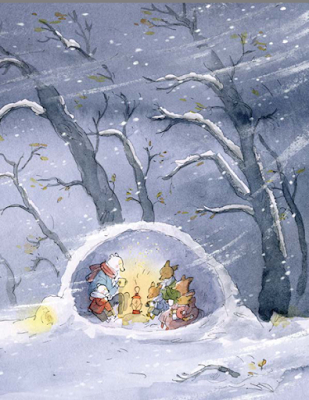 They have closed their doors and are making their dens cozy and warm. Two strangers arrive out of the blustery wind and begin to ask at each door for shelter. They have tea to offer, but one after another the neighbors all say no. The little fox though heads out with a lantern for them, but nothing more. As the snow begins to fall, the strangers know they will be fine. But the fox family’s shelter is failing due to the weight of the snow. Soon they are outside in the falling snow and asking for help themselves. Who will help them? I received this e-arc copy from Kids Can Press for an honest review, thank you! This is a beautiful French story for kids finally reaching audience in English. The story pretty much shows the characteristics of tradition European animal tales - the story has a background message. The Shelter is a story that tells about how world comes and goes around, what you give to one comes to yourself. In a meaning - its nice not to turn your back to someone who is asking your help when you can give it, rath I received this e-arc copy from Kids Can Press for an honest review, thank you! This is a beautiful French story for kids finally reaching audience in English. The story pretty much shows the characteristics of tradition European animal tales - the story has a background message. The Shelter is a story that tells about how world comes and goes around, what you give to one comes to yourself. In a meaning - its nice not to turn your back to someone who is asking your help when you can give it, rather than be selfish and not. This story with it's beautiful watercolor illustrations gives a perfect story atmosphere to little readers bringing them into dark and story autumn/ winter night. It brings the beauty of forest and it's inhabitants, their beautiful and hidden houses. Showing where each and every animal sleeps at winter, what food do they eat and how sharing is caring, and a new friendship is there. Claire’s picture book is a parable for children. In the story, a storm is coming. All the animals seek shelter in their homes. Little Fox is the only character that wonders about the animals who may be stuck in the storm. A bear parent and child are stuck in the storm. They go from home to home looking for shelter. Each family turns them away. “Try the neighbor”, they all say. Including Little Fox’s family. Unable to accept the outcome, Little Fox runs after the bears to give them a lantern to gui Claire’s picture book is a parable for children. In the story, a storm is coming. All the animals seek shelter in their homes. Little Fox is the only character that wonders about the animals who may be stuck in the storm. Including Little Fox’s family. Unable to accept the outcome, Little Fox runs after the bears to give them a lantern to guide their search for shelter. As fate would have it, the snow from the storm weighs down on the foxes den, and the family barely makes it out before their den collapses. The Fox family is able to find their way to where the bears have built an igloo. The foxes knock and ask for shelter for the night. Unlike their response to the bears, the bears welcome the family in. When a big storm is coming, all the creatures in the woods take shelter - the rabbits, the squirrels, the birds and the foxes. All the creatures have a shelter except for the two bear brothers. When the storm hits, the bears are left out in the cold. They knock on the other creatures' doors, but no one will let them in, even when they offer to share their food. The foxes don't open their den, but little fox goes out and gives them a lantern so they will at least have light. The bears wander aroun When a big storm is coming, all the creatures in the woods take shelter - the rabbits, the squirrels, the birds and the foxes. All the creatures have a shelter except for the two bear brothers. The bears wander around for a while until it starts snowing. Then, they use the snow to build a shelter for themselves. When the roof collapses on the fox den, the fox family goes running. They look for new shelter and they find it with the bear brothers. Nel bosco sta arrivando una tempesta, e tutti gli animali si attrezzano per rendere confortevole la propria tana. Durante la tempesta arrivano nel bosco due animali forestieri, e tutti gli animali, preoccupati, si chiedono "chi saranno?" "cosa vorranno?". I due stranieri chiedono asilo di tana in tana, ma sembra che nessuna famiglia li voglia ospitare. Mentre la neve scende, la tana della famiglia delle volpi sembra in procinto di crollare, e le volpi sono costrette a uscire, da chi troveranno ospitalità? Una storia quanto mai attuale, raccontata con disegni delicati dai toni dell'acquarello.